A subnet cannot span more than one availability zone (AZ) in AWS . Because of this, the IP address assigned to an instance in one AZ cannot be reassigned to another instance in a different AZ. Applications that require users have a single IP address for connectivity, such as cloud-based NFS and CIFS services, need a way to failover to a different instance when the node fails. This fault tolerance is key to services like NetApp’s ONTAP Cloud. A single AZ solution does not satisfy users’ demands for a guarantee of an always-on solution. In order to overcome the AWS limitation, applications like NetApp Cloud, rely on “floating” IPs addresses for failover between nodes in different AZs. Floating IP addresses are outside the range of the VPC CIDR. In order to route to these addresses within AWS, they must not overlap with any CIDR range in the same AWS region. Clients connect to the floating IP address rather than the IP address of the node itself. When a node failure (or even an entire AZ failure) is detected, the floating IP address is “moved” to an instance in another AZ. The floating IP solution works well if the client is in the same VPC as the server. 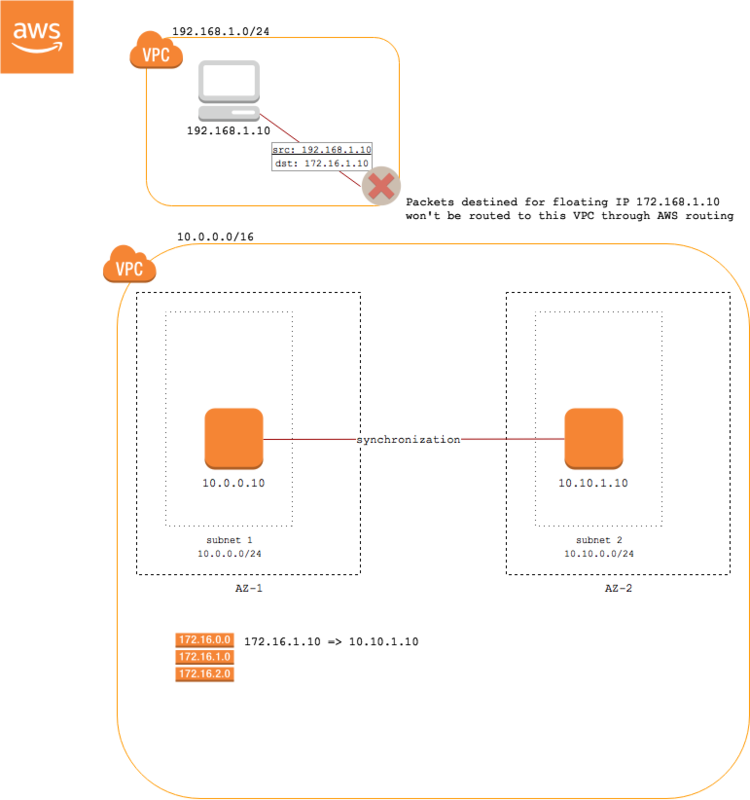 However, if the client is not in the same VPC, AWS routing does not support routing to these IP addresses that are outside of the CIDR range for the VPC. Those packets will never exit the VPC. Aviatrix solves this problem by handling routing of the floating IP addresses in the client VPC. All packets destined for the floating IP address(es) will be delivered to the Aviatrix Gateway. The gateway maintains an internal route table that points those packets to an Aviatrix gateway in the server VPC. Access to the VPC where the client resides. 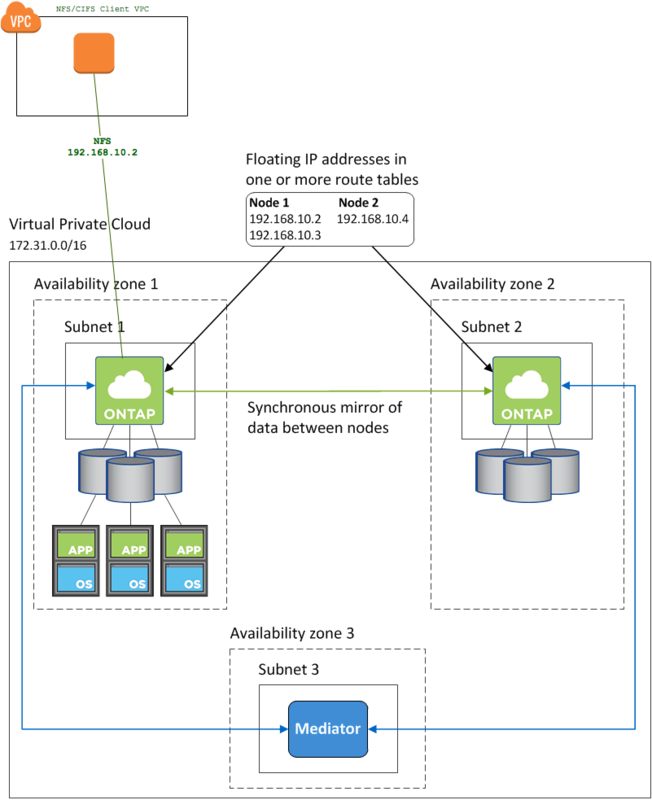 Access to the VPC where the NetApp ONTAP Cloud is installed. The Aviatrix gateway must be installed in a public subnet. If you do not have one created in the VPC where your client application resides, please create one before continuing. Next, create a Gateway in the VPC of your NetApp Cloud installation. The Aviatrix gateway must be installed in a public subnet. If you do not have one created in the VPC where your NetApp Cloud is installed, please create one before continuing. The Aviatrix HA gateway must be installed in a public subnet. If you do not have one created in the VPC where your NetApp Cloud is installed, please create (another) one before continuing in a different AZ than the previous gateway. In the Destination CIDR , enter the list of floating IP addresses (comma-separated). For example, 192.168.10.2/32, 192.168.10.3/32, 192.168.10.4/32. 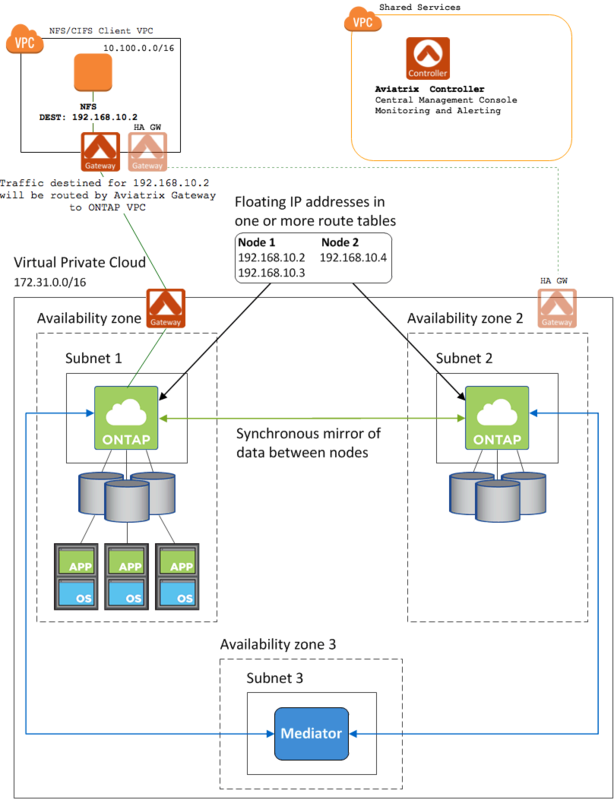 In the NetApp Cloud Manager, be sure to select the subnet(s) where the Aviatrix Gateway(s) is installed when modifying AWS route tables with the routes to the floating IPs. 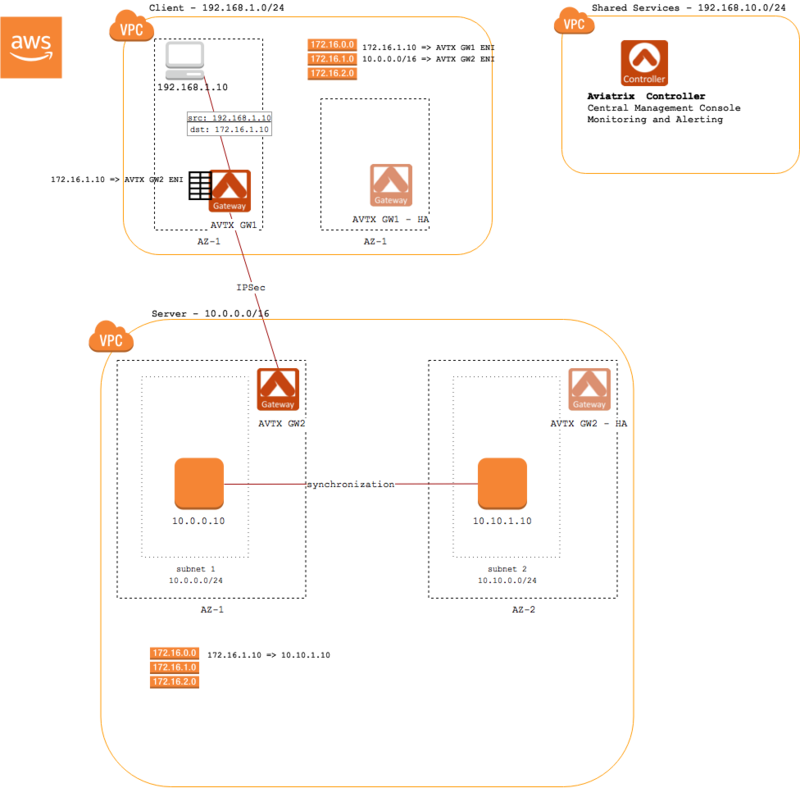 Mount a share on an instance in the client VPC and test connectivity.